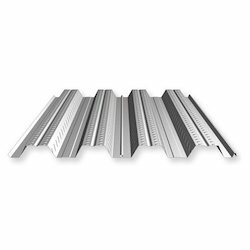 Manufacturer of a wide range of products which include mezzanine floor decking sheet, structural floor decking sheet and decking sheet. 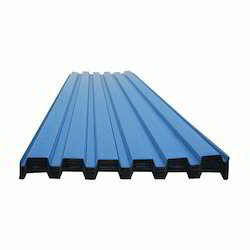 Our organization is specializes in supplying a qualitative array of Mezzanine Floor Decking Sheet. Under the supervision of our adroit professionals, this sheet is designed using the best quality raw materials and innovative technology in line with set industry standards. Used for composite floor system and in many cases as the permanent form work, we offer this sheet in variegated sizes, designs and dimensions. With the help of our state-of-the-art infrastructure unit, we are able to supply the superlative quality of Structural Floor Decking Sheet. Utilizing top notch quality raw materials and modern technology, this sheet is designed under the vigilance of our skilled professionals. The offered sheet is highly praised for its features like easy to use and long functioning life. The provided sheet is used to make steel floor of a building with coating of concrete moulds. We are instrumental in supplying of high quality Decking Sheet. Used as a composite floor system, our sheet is available in variegated designs and sizes as per the requirements of our valuable clients. In line with set industry norms, we only use the best quality raw materials and sophisticated technology to manufacture this sheet. The offered sheet is tested by our quality examiners on variegated parameters so as to ensure its quality.